The entrance opens to the elegant living and dining areas flanked by an open-plan kitchen and enhanced by lofty ceilings. Sliding doors open out to the half open sun deck perched above the 40-foot swimming pool and lower sundeck. Via the pool area you can reach the private boat dock. Master Bedroom Suite: Located on one side of the villa offers a romantic bed, an enclosed bedroom for a baby, and an en-suite bathroom with shower. The bedroom has a King Bed, air conditioning, ceiling fan, and private balcony. Bedroom 3: Independent bedroom with two twin beds, air conditioning, ceiling fan, en-suite bathroom with shower and private balcony. Bedroom 4: Independent bedroom with two twin beds, air conditioning, ceiling fan and en-suite bathroom with shower. Furnished in a blend of contemporary creole and timeless Mediterranean style, the tasteful living and dining areas open to the half open sun deck perched above the swimming pool and lower sundeck. Dining table seatng for 6 persons is located on the covered terrace. 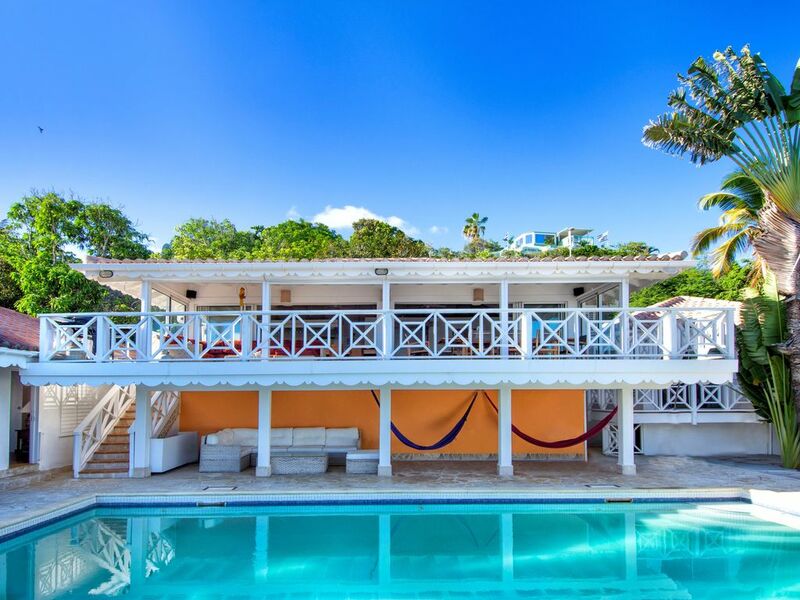 Overlooking Oyster Pond &amp; St. Barths, all bedrooms are air-conditioned, safe, phone, satellite TV, VCR, DVD player, stereo with CD player, high speed WiFi Internet connection, BBQ.